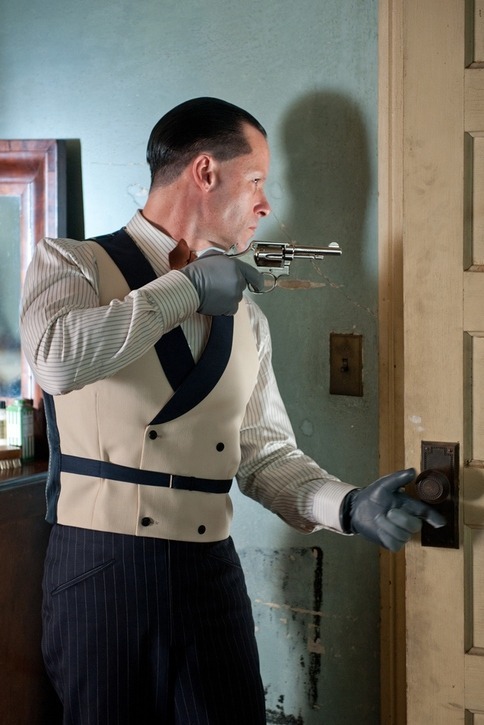 "Do you have any idea what a Thompson machine gun does to a mortal?" 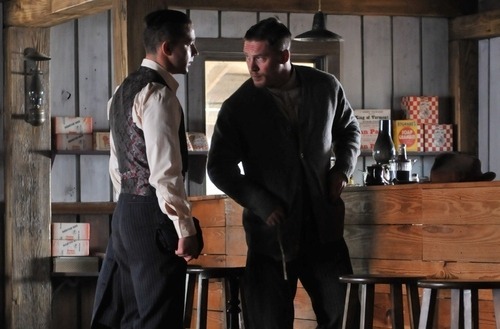 There's an old adage about a collective work of art being less than the sum of its parts, and that adage can be firmly and appropriately applied to the new film Lawless. It features a fantastic acting ensemble, a director who knows his way around desolate and sparsely violent landscapes, and a screenwriter/composer who has proven himself adept at both of those worlds, but these parts just don't add up to a great film. Which is unfortunate, because it had all the potential in the world to be one of the year's best. 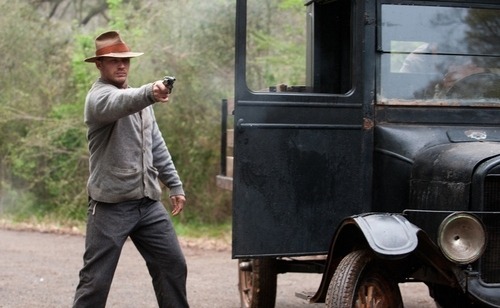 Based on Matt Bondurant's novel "The Wettest County in the World", Lawless tells the Prohibition-era true story of a family of crooked bootleggers in the mountains of Virginia. 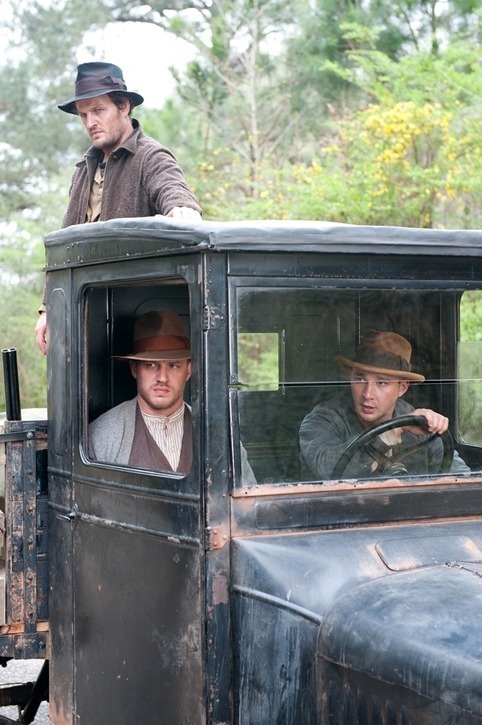 The Bondurant Brothers, Forrest (the always fantastic Tom Hardy), Howard (Jason Clarke) & Jack (Shia LaBeouf) find themselves in a bit of a pickle when a Special Deputy by the name of Charles Rakes (Guy Pearce) is sent to deal with the family, but informs them that he has other interests in mind. The boys get in even deeper when a rival bootlegging gang headed by Floyd Banner (Gary Oldman) begins muscling in on their territory. When their de facto leader Forrest is wounded, Jack finds himself in the position of having to man up and protect his family's business, or watching the whole thing come unraveled. There are some truly unusual circumstances that lead up to the ending, which are almost impossible to discuss in a spoiler-free review. Needless to say, you'll find yourself shaking your head in disbelief and will likely chalk it up to the fact that the truth is sometimes stranger than fiction. The film is beautifully shot by Benoit Delhomme, who handled DP duties for director John Hillcoat's 2006 film, The Proposition. If you were a fan of that film, I think it's safe to say you'll find a lot to like here, but not much to love beyond how gorgeous the film looks. The film owes its entire existence to Arthur Penn's Bonnie & Clyde, and seems at times to be desperately aping that film's beautifully violent aesthetic. That film is one of my all-time favorites, and likely the reason that I didn't enjoy this film as much as I should have because it seems to be trying to one-up Bonnie & Clyde rather than paying homage to it. The performances are all solid, with the glaring exception of LaBeouf. He is so firmly out of his element in this rugged ensemble that his third act transformation is not only thoroughly unbelievable, it's downright laughable. LaBeouf is hardly one of the premier actors of his generation, and he looks like a rank amateur in such formidable company. Hardy, Oldman, & Pearce are all top-notch, as is Jessica Chastain as the object of Forrest's affections. Mia Wasikowska is also good in a small and largely thankless role. The filmmakers would have been smarter to swap LaBeouf with the much better and severely underused Dane DeHaan. DeHaan, whom you may know from this year's Chronicle, plays the family's genius moonshine cooker, Cricket. He's a magnetic screen presence, and does so much more than LaBeouf does with so much less material. He is definitely an actor to watch for in the future. Screenwriter & composer Nick Cave has a unique ear for dialogue & captures a wonderful interplay of dialogue between these varied characters, but ultimately the film falls apart in the third act & really fails to stick the landing. Without the benefit of having read the book, I'm not sure at who's feet the fault for this lay, but what started out as a fun, engaging thrill-ride ended up running out of gas and basically sputtered to a halt. I had high hopes for the film, and maybe if you go into it with lowered expectations, you'll enjoy the film more than I did. There's certainly a lot of great elements on display, some excellent performances, and a really strong first two acts, but in the end, it fails to be better than the sum of its parts. It's not as big a failure as, say, a film like Troy which had similar third act issues combined with otherwise great technical elements, but it still fails to live up to its potential. And at the end of the day, that's almost a greater crime than just being flat-out terrible.